Fernanda Sibilia brings the flair of Latin American craftsmanship to her captivating metal mobiles. Argentinian jewelry designer Fernanda Sibilia brings the flair of traditional Latin American craftsmanship to her captivating metal mobiles. 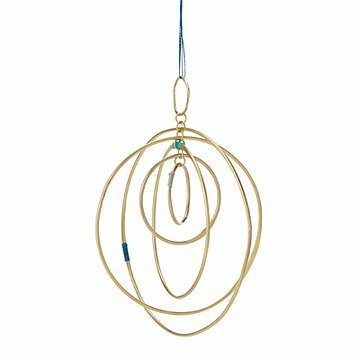 To make this geometric composition, she hand shapes a series of concentric brass rings, accented by sections wrapped in blue-green thread. Stirred by the slightest breeze, they orbit one another in a playful dance. With its handmade appeal and meditative motion, this mobile makes an intriguing visual display for any space in your home. Handmade in Buenos Aires, Argentina. Please avoid direct contact with water (salt or fresh), excessive perspiration, and chemicals such as chlorine, sulfur, perfume, detergent, chemical agents, cosmetics or oxidizing cleaning products such as dish washing liquids. The metal may darken or tarnish with normal exposure.